Connecting Sequim utilities or transferring the electric and other utilities from seller to buyer can be confusing, especially if you're trying to do it long distance. Here's a short primer to clarify how it all works for you as a buyer. 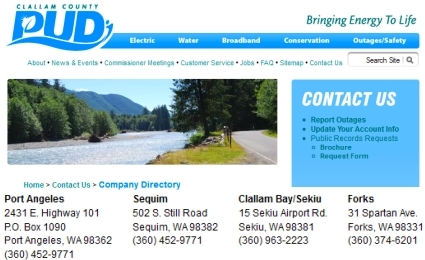 The Clallam County PUD will transfer Sequim utilities so that on the day of closing it will be done, but you have to complete the application and fax it to the PUD prior to closing, and it would be best not to wait until just before closing. The PUD told me that it would be best to call them as early as you can, and I should think that two weeks prior to closing would be reasonable. Once they have your completed application, they can get it all done very quickly. I would recommend getting your application faxed to PUD one week prior to closing so there is no delay in getter your Sequim utilities transferred. You can call PUD and they will email the application (or fax or send by snail mail), and once you've filled in the information and faxed it back, you are done. It's not hard. What happens if you don't get it done? The utilities get disconnected, and the seller is charged a fee (about $30), and then you have to schedule an appointment to get the utilities re-connected. You can call the PUD at 360-452-9771 to transfer your Sequim utilities.